Main stone:Natural Crystal. Earrings size:11MMx11MM. Main stone:Austrian Crystal. Earrings size:25MMx12MM. Main stone:Natural Crystal. Earrings size:35MM 10MM. DOLCE & GABBANA. Model: Clip on Dangling. Motive : Floral. Crystal : Clear and pink. Material: 30% Crystal, 70% Brass. Color: Gold and red. S925 Silver Earrings. 18K Gold Earrings. Main stone:Natural Crystal. Earrings size:35MM 10MM. 18K Gold Set. S925 Silver Ring. S925 Silver Necklace. S925 Silver Bracelet. Main stone:Austrian Crystal. Earrings size:15MMx15MM. S925 Silver Earrings. 18K Gold Earrings. Main Stone:Austrian Crystal. Earrings size:12 MM 12MM. S925 Silver Ring. S925 Silver Necklace. S925 Silver Bracelet. 18K Gold Ring. Main stone:Austrian Crystal. S925 Silver Earrings. 18K Gold Earrings. Earrings size:12MM High. 18K Gold Set. S925 Silver Ring. S925 Silver Necklace. S925 Silver Bracelet. Earrings size:12MM High. Main stone:Austrian Crystal/Zircon. Main stone:Austrian Crystal. Earrings size:20MM 10MM. S925 Silver Earrings. 18K Gold Earrings. Main stone:Austrian Crystal. Earrings size:20MM 10MM. 18K Gold Set. S925 Silver Ring. S925 Silver Necklace. S925 Silver Bracelet. Main stone:Austrian Crystal. Earrings size:10MM High. S925 Silver Earrings. 18K Gold Earrings. Main stone:Austrian Crystal. Earrings size:10MM High. 18K Gold Set. S925 Silver Ring. S925 Silver Necklace. S925 Silver Bracelet. Earrings size:21MM 10MM. Main stone:Cubic Zirconia/ABS Beads. Main stone:Natural Crystal. Earrings size:36MM High. Condition: Metals Type:18K Rose Gold GP Stone: Austria crystal Earrinngs Length: 13mm Earring Diameter:8mm Zircon Length: 8mm Gender: Female Package: 1pc Earrinngs Style:Fashion About item: * Featuring Synthetic Lab Created white Austria crystal 8MM, Round-shaped and rose flower setting, faceted and full of sparkle. and crystal is well known as a substitute for diamond. *If the item is often exposed to water, it may TURN GREEN. there no harm to the body. just cooper oxidation. you can gently wipe it with clothes to make it shiny. *Avoid contact with perfumes, chemicals, hair dye, sweat .avoid collisions and friction.Avoid contact with high temperatures and acid, alkali solution. *Nothing can be solved by communication. Main Stone:Austrian Crystal. Earrings size:12 MM 12MM. 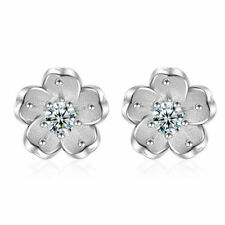 DOLCE & GABBANA Coins and Flowers Clip-On Earrings 05462. - Greek Coins, Cherry Flowers and Madonna engraved "Monete e Fiori" Clip Earrings in Gold and Pink by DOLCE & GABBANA. - RUNWAY - Dolce & Gabbana Fashion Show. Gold Tone Flower Dangle Earrings with Fuchsia Picasso Beads. Nature. Summer. Chunky Super Cute! Square face shapes suit many different types of earrings, however you should avoid long straight earrings as these will accentuate the shape of your face and elongate your jaw line. Earrings size:28MM High. Main stone:Austrian Crystal. Chunky Super Cute! If you have a round face, choose earrings that will add length and contain angles. 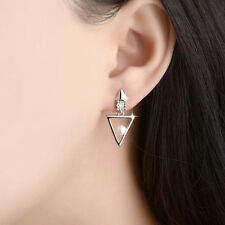 Keep clear of small stud earrings and drop earrings with rounded shapes. When wearing stud earring, choose bold angular shapes. Elizabethan Crystal Drop Earrings from the Collection of the Museum of London. HIGH QUALITY MATERIAL - Crafted in Pewter with crystals. [California Prop 65 Warning: Lead in Crystals]. Part of the proceeds from the sale of this product support the Museum of London. Materials: Silver Sterling and Lucite. Length: 5.5cm Drop length: 5.5cm. Beautiful and delicate pair of earings. Stunning addition to your outfit. Width: 1 cm. Gift for: Bride /Bridesmaid /Mom /Girlfriend /Wife /Daughter /Female Friends /Yourself. Main Stone: Black Color Rhinestone. Earrings Size：14mmx18mm ,Plum 8mm. 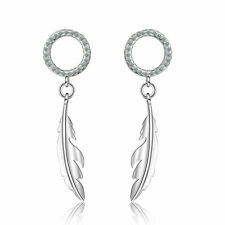 Earrings Material: Sterling Silver Natural Shell Zircon Crystal. Silver Lotus Leaf and Opal Ivory Crystal Earrings. Nature. Bloom. Silver Lotus Leaf and Opal Ivory Crystal Earrings. This is a darling pair of small sterling silvermaple leaf earrings. 1 1/4 in long. They have 2 small olive green crystal beads on the sterling silver earwire. Made in the USA. Buy them just the way they are shown, or I can make these with almost any colored crystal or glass you would like.